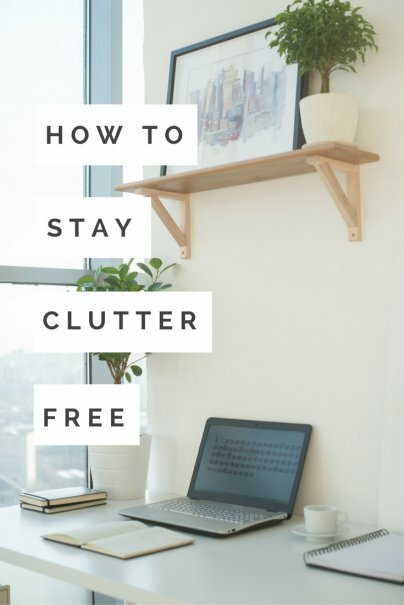 As I've tried to determine the best ways to think about handling clutter and then to actually declutter, these are the best tips that I have found. I hope they work for you, too (and, please, if you have any that I've missed here, let me know!). Nearly everyone who declutters has rules. A few say that everything they haven't used in a year has to go. Others say that they can't buy anything new without getting rid of at least one old thing. Whatever rules you choose, make sure they work for you. Just because something works for a friend or for someone you read online does NOT mean that it will help you. Decluttering can feel overwhelming, and it's easy to start in one area, then get distracted when you're taking an item somewhere else to put it away, and end up never finishing the first area. Even if you aren't a list person, it can help you to have a visual reminder of all the areas in your home that need decluttering. Then, whether you work your way through them in order or just do what comes naturally, you can check them off as they get cleared. It's tempting to go to Home Depot or Target and buy a bunch of colorful bins in a bunch of different sizes, but the truth is that you don't know what you need until you've gone through your stuff, gotten rid of what you no longer want or need, and figured out where and how you want to store the rest. Besides, if you buy the bins first, they will just add to the clutter until you bother to use them. It's great to have a place for everything. In fact, it's fabulous. But if you'll never be able to find your stuff, or you'll have to search and search every single time you want something, the places where you're keeping things aren't working. You may have to use some trial and error here. What initially seems like a logical place for an object may not be the first place you think of looking for it later. In addition to putting things where you expect them to be, you'll also want to put them in places where you will actually go and get them to use them. For instance, it is logical and helpful for us to put my kids' art supplies in the basement. However, our basement is cold and we have found that, in the winter, we don't do art simply because we don't want to go down and get the supplies. If we want to use them, they need to move! 10. Stop at "Good Enough"
Decluttering can take forever. I don't just mean that it can take a long time, but that you could literally organize forever, if you let yourself. Instead of devoting the rest of your life to a task that most of us find annoying, stop when you have achieved a level of organization that works for you. That means you need to think about function. In general, if you can find things when you need them and you don't have piles everywhere, you can probably consider yourself done. This may seem to go against the point I made above. However, I'm not saying that you should continue to declutter and organize the same areas to an infinite level of detail. You will, though, need to continue removing clutter and organizing new items as things get moved or more things come into your home. This means going through your mail every day, helping your kids return toys and other items to their places, and more. Plan to spend 5-15 minutes every day on clutter, in order to remain clutter free. Think about already decluttered spaces as being inoculated with Penicillin. This means that, once you have cleared clutter from an area, that area is clutter-free. No matter how bad the clutter may get in other places, that one remains clear. As you move through your home and continue to declutter, you will have more and more spaces that are clear. Eventually, your whole house will be inoculated. Choose a place in your home where you will put everything that doesn't have a home until you can find the time to give it one. This is where the mail goes when you bring it in, where birthday and Christmas gifts get stored until you decide where they go, where items that need to be re-filed or put back in their places get set until you can do that. This way, you will limit the areas of your home that gather clutter, and you will know where to go (and, at a glance, how much work you have to do) when it is time to declutter. Every night, my husband tosses his keys, wallet, keycard, and whatever else happens to be in his pockets . . . somewhere. Not only are they hard to find after that, but I hate the cluttery way this makes our kitchen/bathroom/bedroom/wherever look. To solve the problem, I put a small basket on a shelf by our door. Now, as soon as he gets home, he puts all of his pocket stuff in there. I don't have to look at it, and he can always find it. As my kids get older, they each have baskets in our main living area, too. This is where they put toys that they brought down from upstairs, snacks they want to finish later, etc. You know those things they make for silverware drawers, so you can separate your knives, forks, spoons, etc? Well, they make those for all sorts of drawers. They're great for organizing everything from your socks and underwear to all of the random stuff you keep in your nightstand. It can even help in your junk drawer, so you can actually find the things that you toss in there. There are a million different ways to think about clutter. Some love the philosophy at Unclutterer. Others respond to the Fly Lady. The point is, there are lots of different ideas and methods online for dealing with clutter and, if you can find the one that works for you, you'll have a lot more success and motivation for decluttering than you might have otherwise. What's your favorite way to declutter?